GPCR Gq stimulation is known to induce phospholipase C (PLC) activation and trigger the Inositol phosphate (IP) cascade. IP1, a downstream metabolite of IP3, accumulates in cells following Gq receptor activation and is stable in the presence of LiCl, making it an ideal GPCR (Gq) functional assay. Cisbio has developed a monoclonal antibody-based IP-One ELISA to enable simplified and highly accurate measurement of IP1. IP-One ELISA is a competitive immunoassay which uses IP1-HRP and an anti-IP1 monoclonal antibody. 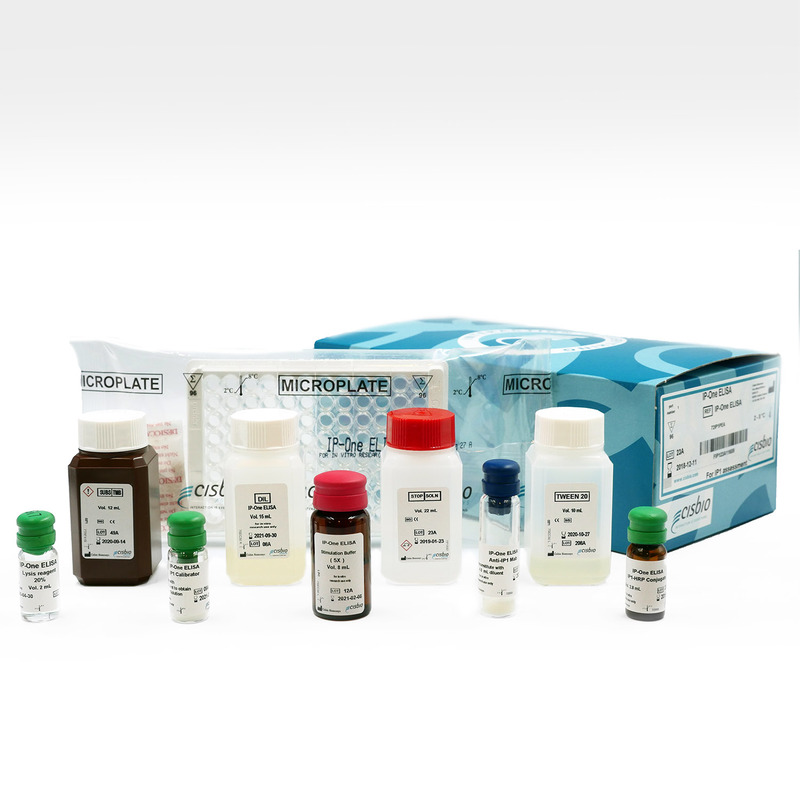 The kit comes with 96-well microplates pre-coated with an anti-mouse antibody. Cells are stimulated in the presence of LiCl, causing the accumulation of IP1 upon receptor activation. The protocol consists of two steps following cell stimulation: addition of ELISA components and addition of TMB, the HRP substrate. The HRP reaction is stopped and the optical density (OD) read at 450nm. IP1, a downstream metabolite of IP3, accumulates in cells following Gq receptor activation. It is stable in the presence of LiCl, making it ideal for GPCR (Gq) functional assay. The Cisbio IP-One ELISA is compatible with cell lysates, enabling live cell functional assays. Cells can be stimulated using a variety of plate formats prior to the IP-One ELISA detection steps. This figure shows the results of an IP-One ELISA performed on cells stimulated in either a 24- or 96-well format. Cells were lysed and then transferred to the ELISA plate provided in the kit. We used 80,000 cells per well in the 96-well plates and 400,000 cells per well in the 24-well format. Both cell stimulation formats produced similar results, with low standard deviations.